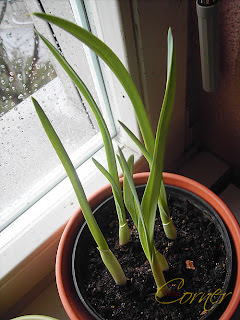 Before Easter I always plant some garlic cloves so that I have fresh green garlic. It is pretty easy to do. 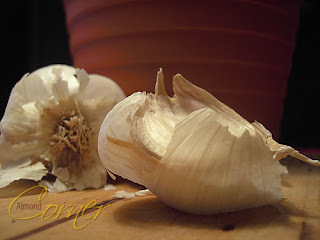 Split garlic into cloves. 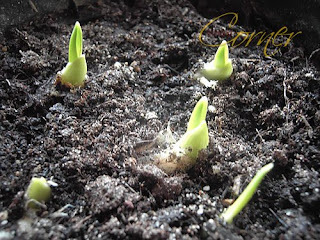 In a pot put some soil ( I always use cactus soil, but I do not think that matters). Water it and put it on a sunny place, like in front of the window. After 3 days they should start growing. Of course you can do the same with onion. 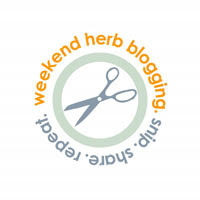 This is my entry for Weekend Herb Blogging hosted by Anna from Morsels&Musings. Update: After 8 days they are already that high. I'm going to do this. Thanks for the idea! Very interesting! Now I want to try it. 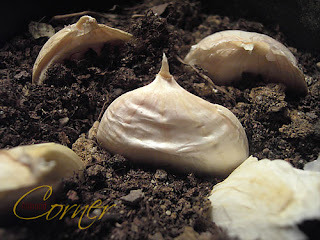 I have grown garlic outdoors, but not like this.